Moshe Arens was an Israeli politician and diplomat who served as Minister of Defense three times and Minister of Foreign Affairs once. Arens was born in Lithuania on December 27, 1925, and moved with his family to Latvia in 1927, and then to the United States in 1939 when he was 14. During World War II, Arens served in the United States Army Corps of Engineers. In 1948, shortly before Israel declared independence, Arens again moved with his family to the Jewish State and joined a group of American Betar members who settled in Mevo Betar, a border settlement in the Judean Hills. He joined the Irgun and later became a founding member of the Herut political party. Unable to find a job in Israel, Arens moved back to the U.S. in 1951 and studied mechanical engineering at the Massachusetts Institute of Technology and aeronautical engineering at the California Institute of Technology. When he finished his studies and returned to Israel, he became a professor at the Technion-Israel Institute of Technology in Haifa from 1957 until 1962. Arens left academia and became the deputy CEO of Israel Aerospace Industries from 1962 until 1971. For his work there to strengthen the nation’s security, Arens was awarded the Israel Defense Prize in 1971. After the Yom Kippur War, Arens entered politics and was elected to the Knesset as a member of Likud in the 1973 elections. After being re-elected in 1977, he became chairman of the Foreign Affairs and Defense Committee. He voted against the Camp David Accords and the Egypt–Israel Peace Treaty because he believed total withdrawal from the Sinai was too high a price to pay for the agreement. Arens was re-elected to the Knesset, but resigned his seat in 1982 to serve as Israel’s Ambassador to the United States. He returned to Israel in February 1983 and was appointed Minister of Defense, replacing Ariel Sharon after he was forced to resign following the publication of the Kahan Commission’s report on the Sabra and Shatila massacre. Re-elected to the Knesset in 1984, Arens was this time appointed Minister without Portfolio. During his tenure Arens championed the Lavi fighter jet project. The Lavi was to be Israel’s first homemade fighter designed, in part, to reduce Israel’s dependency on American planes. The United States initially supported the project and ultimately provided $1.5 billion in military aid toward its development before souring on the program as its cost ballooned. Despite its advanced design, the Israeli Air Force reduced the number of planes it planned to buy, in part due to pressure from the Pentagon, significantly increasing the cost of production and making the Lavi more expensive than the U.S. F-16. By a single vote, the cabinet decided to scrap the Lavi program in 1987. 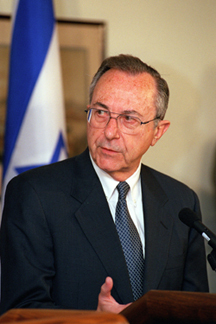 After another re-election in 1988, Arens was appointed Minister of Foreign Affairs and, in 1990, was returned to the Minister of Defense portfolio, a position he held until 1992 when he retired from political life after the Likud was defeated in the election. Benjamin Netanyahu was a protégé of Arens, serving as his deputy at the Ministry of Foreign Affairs and later as an attaché when Arens was Ambassador to the United States. Arens also appointed him ambassador to the UN. Arens returned to politics in 1999 to challenge Netanyahu for the Likud leadership although he failed in his challenge, Netanyahu appointed him Minister of Defense. Likud, however, lost the general election in 1999 and Arens was pushed out of the cabinet. He lost his seat in the Knesset in the 2003 elections. Arens also served as chairman of the International Board of Governors of the Ariel University Center of Samaria. Arens often spoke about the need to integrate Arab citizens into mainstream Israeli society. When it came to the Palestinian issue, he was considered a hardliner. He opposed the Oslo Accords and, later, Israel’s disengagement from the Gaza Strip in 2005. Believing Israel had no partner for peace, he advocated annexing the West Bank and giving the Palestinians Israeli citizenship, disbelieving warnings that doing so would threaten Israel’s Jewish character. He wrote eight books, including an autobiography published in 2018, and was a columnist for Haaretz. One of his books, Flags Over the Warsaw Ghetto, and much of his writing late in life focused on the role of the Betar fighters in the Warsaw ghetto uprising. Arens died on January 7, 2019, at the age of 93. Isabel Kershner, “Moshe Arens, Israeli Statesman and Ex-Defense Minister, Dies at 93,” New York Times, (January 7, 2019).